A couple of days ago, I was asked in the comments thread about why and how our church worked towards increased delegation and decentralization in our church structures. In the church planting church community of PLNTD, I attempted to explain this in greater detail. I am copying my article here below for my blog community. Bear in mind, I wrote this as a discussion article for church planting churches, so the context/audience is rather specific. Basically, the HAS model is a centralized philosophy of ministry where the majority of the work in ministry is done by those comprising the hub. For the traditional Baptist church, this hub is the pastor or pastors in leadership (and maybe deacons). 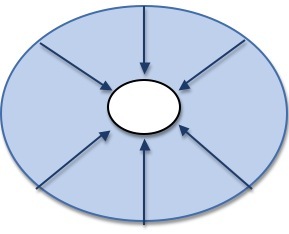 The arrows are pointing inward because the spokes represent the needs and opportunities of the church being met through the competency and capacity of the hub. The result of HAS is that those who are not in the hub do not think they bear any responsibilities in the church. They don’t have to be active participants, perhaps because they don’t feel they have the professionalized training or education of those qualified in the hub. The idea of “lay” people sets in, marginalizing the work of the church to a very small number while leaving the majority of the church in passive, low-expectation mode of existence. Disciples don’t necessarily have to be made because the investment of the work is not delegated to anyone outside the hub. The HAS model therefore necessarily leads to two things: control and maintenance. Those in the hub feel pretty comfortable with the direction of the church because they control all of it. It’s in their hands entirely. If they don’t do it, it won’t get done. They are looked to as the engine behind the machine. Moreover, HAS leads to maintenance mode because there is only so much those in the hub can manage without things starting to fall apart. The average solo pastor is said to be able to pastor 75-100 people effectively. Once you get to 150-200 people, it feels like the wheels are falling off because the pressure on the hub from the spoke causes the paradigm to breakdown. That is one large reason why most traditional churches struggle to break the 200 barrier in attendance—they simply cannot manage any more growth in maintenance mode. One option to address the problem is to make the hub bigger—to add to the centralization with more “professional” staff and personnel qualified to be in those positions. This is the approach of most mega-churches today. As the hub gets bigger, the roles get more specialized, but it is still only those in the hub who are considered the “doers” of the work of the ministry while it is normal fare to be a member in good standing by giving money to the church, attending stated meetings, and being a good lay person by not causing any problems by rocking the boat. 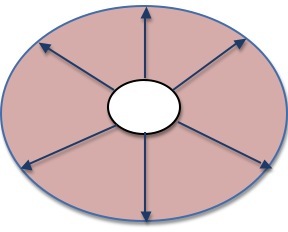 As you can see, the hub functions differently than in the HAS model. First, instead of being centralized (movement inward), CAR is fundamentally decentralized (movement outward). Instead of those in the hub being responsible for the work of the ministry, it is those outside the hub who carry out the work by meeting needs and facilitating opportunities for ministry and mission. Biblically, this is called the priesthood of all believers or practically “every-member-a-minister” where every person in the covenant community discharges their gifts and abilities for the spreading of the kingdom in word and deed. It is an expectation of all members to discover their spiritual gifts, find their place in service of the kingdom, and partner together with others in the body of Christ. While pastors and deacons are certainly called to minister and labor along with the rest of the body, what is unique among them is the (1) work of an overseer, (2) the call to equip, and (3) modeling exemplary lives for others to imitate. Along these lines, it is important that decentralization take place through relationships for the purpose of making disciples and carrying out Christ’s mission. CAR therefore focuses on mission rather than maintenance, permission-giving rather than control-keeping. It largely depends on the stewardship of the mission through disciple-making and leadership development to facilitate the ever-expanding work of ministry with new laborers being released into the harvest fields. It is comfortable with a culture of “amateurs” and apprentices because those in the hub understand that their competency and sufficiency comes from the Lord. Instead of giving them spiritual goods and services to consume, they are given a mission to give their lives for. The challenge for those in the hub of CAR model is to create structures that encourage decentralization and systems/processes that facilitate its purpose and philosophy. For instance, how are you going to intentionally structure your church for discipleship and leadership development? How much time during the week are you going to devote to this? What kind of relationships will be necessary for this to work? Also, how are you going to teach and train your church in the transitioning process to see the need to embrace such a vision and approach to ministry? Again, this all goes back to (1) how the leadership is perceived by the congregation and (2) how they function in their calling. Church planting churches have understood that the way to organically reproduce is structure simply for disciple-making, invest in leadership development, equip members for ministry, empower leaders with “permission,” and cultivate a sending culture where the mission is celebrated. When this happens, churches are mobilized for mission and prepared to launch new churches with the kind of DNA, ministry experience, and training necessary to flourish and be fruitful in their gospel endeavors.